Marisa Cleveland has stopped by The Library to talk books with us as part of her virtual book tour with Goddess Fish Promotions. Marisa will be awarding a $25 Amazon GC to a randomly drawn commenter during the tour--just fill out the form at the end of this post. You can see the other stops on the tour by going to http://goddessfishpromotions.blogspot.com/2013/08/virtual-nbtm-tour-reforming-cowboy-by.html. Thanks for stopping by, Marisa. What is your favorite book? I love The Giving Tree! That was the first book I remember where I had a visceral reaction, and I was like, "Yes! Books!" Do you have any bad book habits? I do, but please try not to judge me. I love to underline phrases in books. But not in books I borrow from others. Just in my own personal books. As long as there are no stray marks in the library books, I'll let you slide! E-Reader or print? and why? Both! I love to read, and if it's a really great book, I'll buy the e-book for myself and the print book as a gift/recommendation for someone else. One book at a time or multiples? Both! :) One book per genre at a time. I have a contemporary romance on my phone (iBooks) and a historical in my Kindle, plus a new adult and a paranormal in print. All scattered around the house. Least favorite book you've read this year? I tried to read some non-fiction this year and found that I'm not a fan of How-to books. I do most of my leisure reading at night or on the weekends. Cuddle next to my hubby on the sofa or in bed. How do you keep your books organized? I turned one of the bedrooms into a "library" where hubby arranged six bookcases for me. I have all the adult books in one section alphabetically organized, and one bookcase is reserved for the YA books. Thanks so much for having me on your blog! I love your avatar with the girl balancing all the books! So super cute. Marisa Cleveland loves to laugh, hates to cry, and does both often. As a writer, she writes. Every day. Perhaps because she married her best friend, her adult romance novels focus on relationships developed through friendship and family-oriented values. She loves to connect with other writers and readers. Find Marisa on Twitter, Facebook, Google Plus, Pinterest, Tumblr, and Goodreads. Great to meet you Marisa. 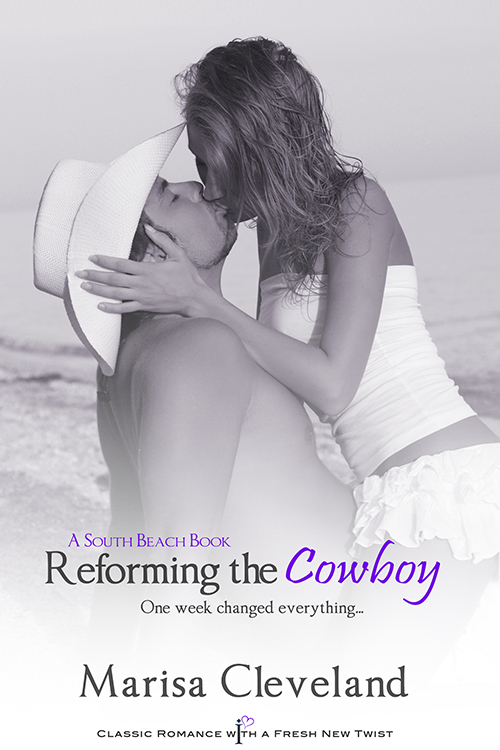 REFORMING THE COWBOY sounds like a fantastic read. How interesting your experience reading non-fiction this year! I read a LOT more non-fiction than fiction, but I'm not too big on how-to books. Sounds very interesting,loved the interview!